I love crazy quilting! 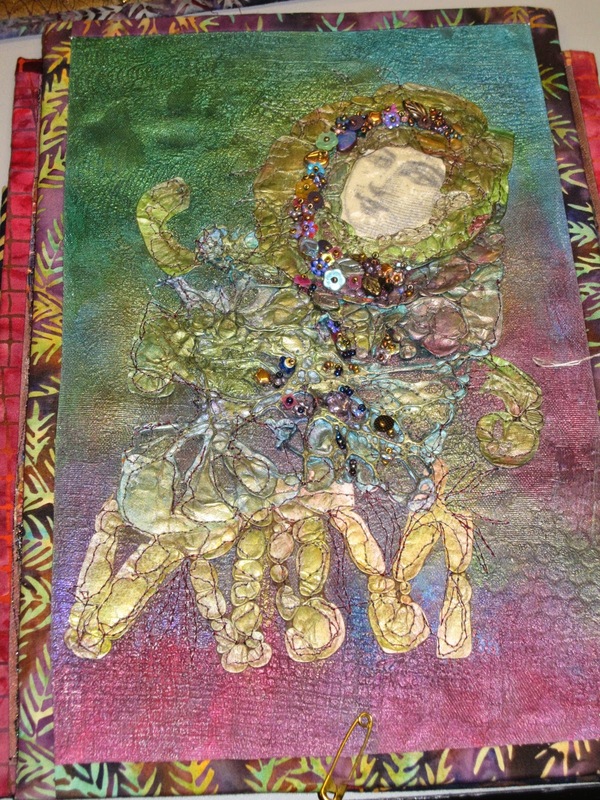 I have not done any pieces in many, many years but recently I went back to this love thanks to a former client of mine who purchased a crazy quilted stocking from me back in the early 90's! First of all, I should define "crazy quilting". I do not mean that quilters are crazy (though some may be) rather it is "a method of laying down bits and pieces of fabric in a haphazard fashion and sewing or appliquéing them to a whole cloth" (Webser's Seventh New Collegiate Dictionary). Those of you that know me at all, will realize that this type of quilting is right up my alley! 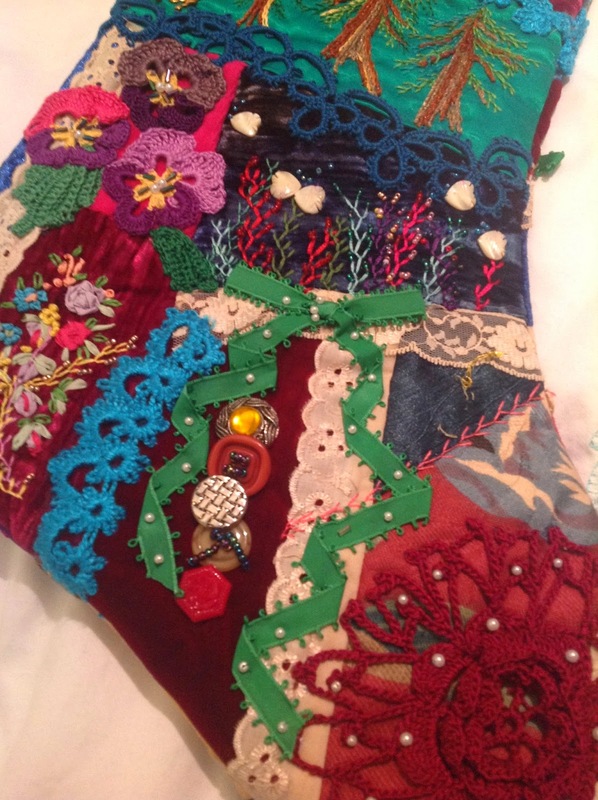 Once the whole cloth is covered then the fun begins as each seam is encrusted with decorative details and a combination of embroidery, crocheting, tatting, and beading. 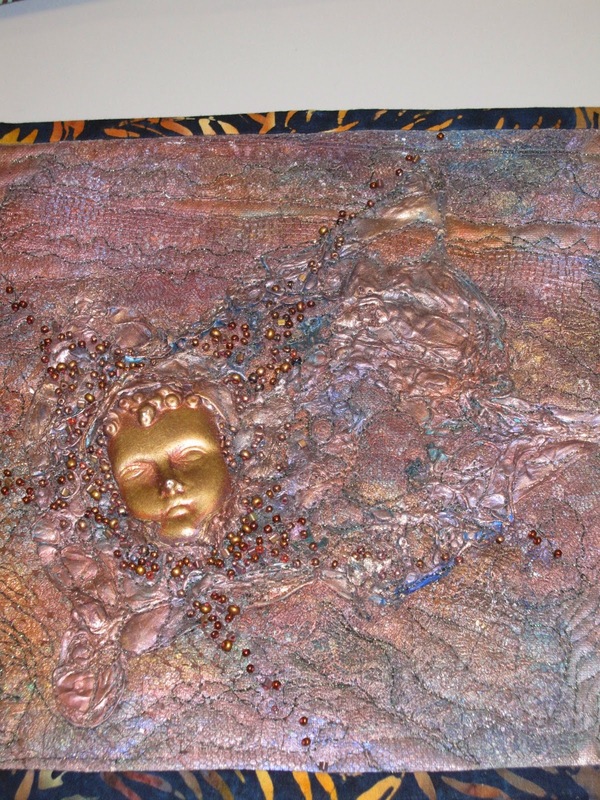 Now back to my story of how I returned to crazy quilting : well the former client tracked me down accidentally while attending a "Figurative art" show at the Coast Collective gallery back in October of 2013. 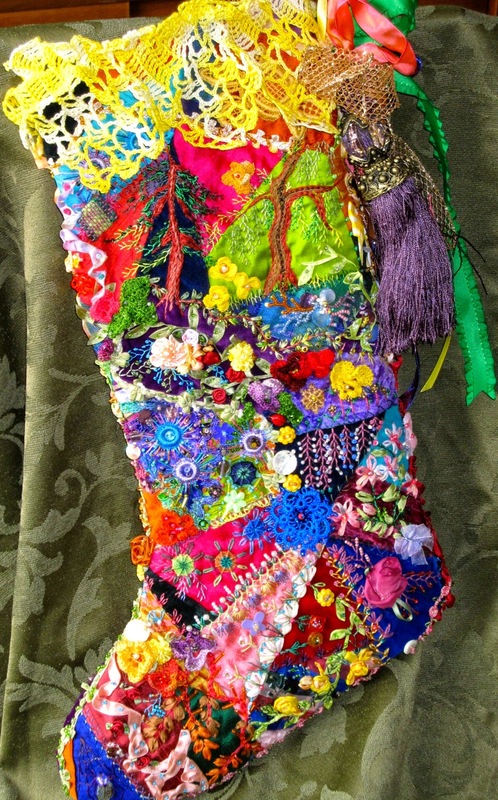 She talked to me and recognized my dolls in this show and asked if I had made crazy quilted Christmas stockings years ago. I said that I did indeed make them years ago and you could see her face lit up! 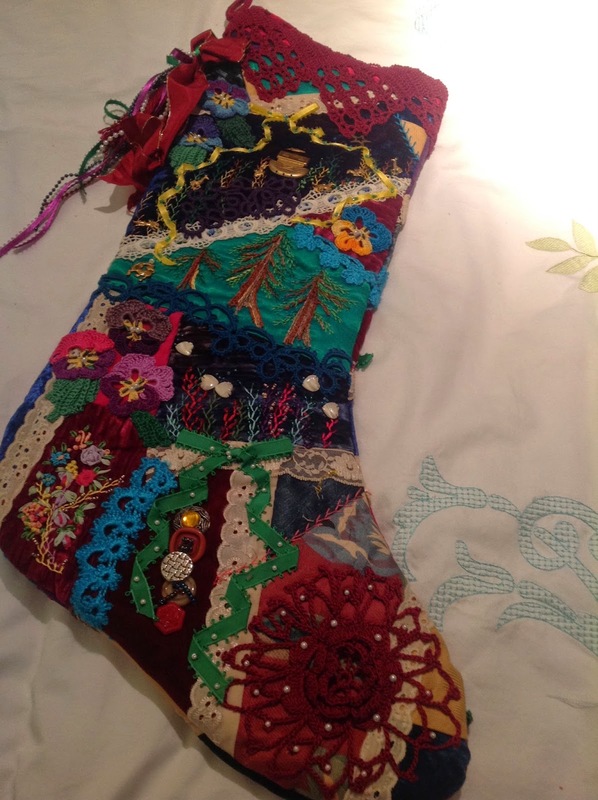 She had purchased one of these Christmas stockings and still had it and treasured it year after year. She told me that she had always regretting not purchasing another one and asked if I could make one for her for Christmas 2014. 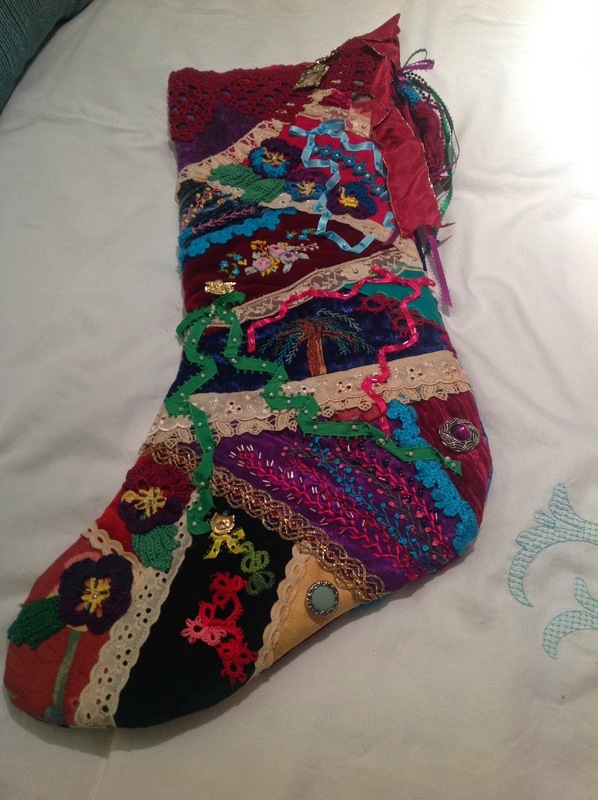 I was reluctant at first as I did not even keep one as an example and had not taken any photos of the finished stocking. She assured me that she would send me photos if only I would agree to make her another one. I agreed and I am happy to say that it is done and I love it. I hope she loves it as well. 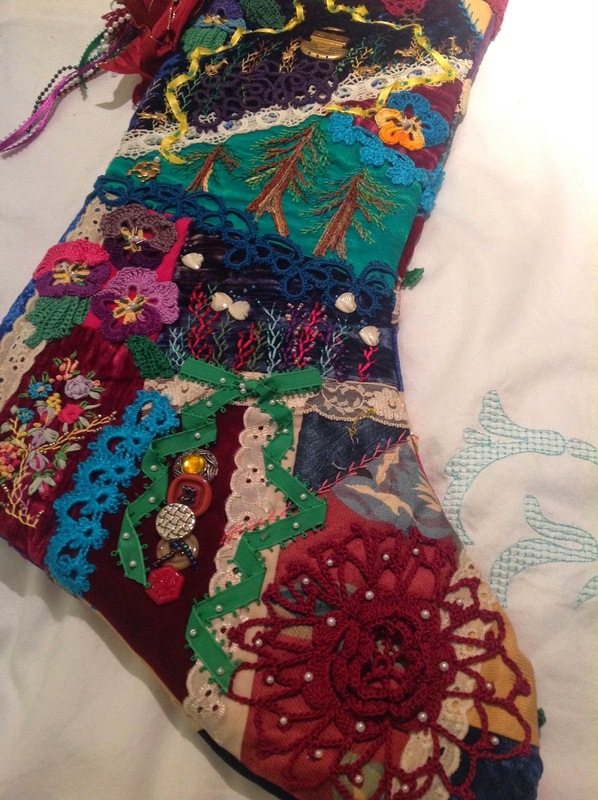 This is the other side of the same stocking. 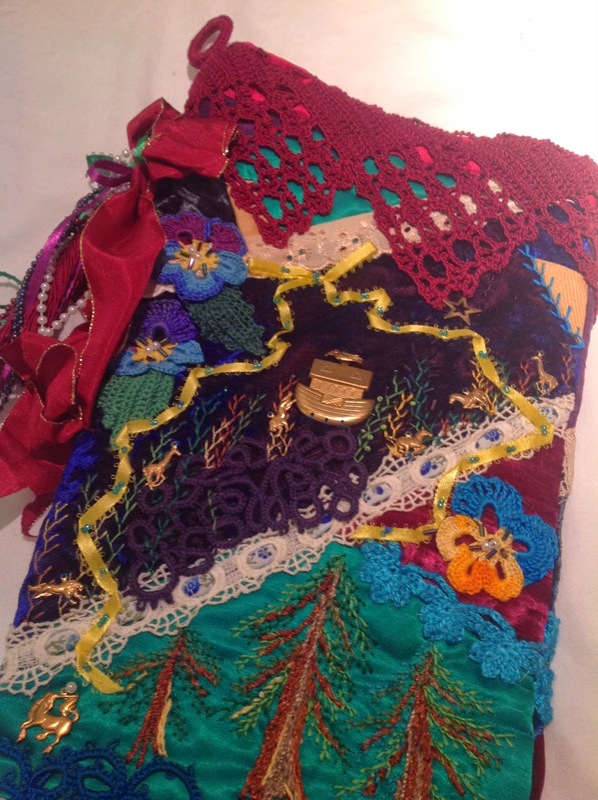 I loved embroidering the trees and I loved making the pansies in crochet. 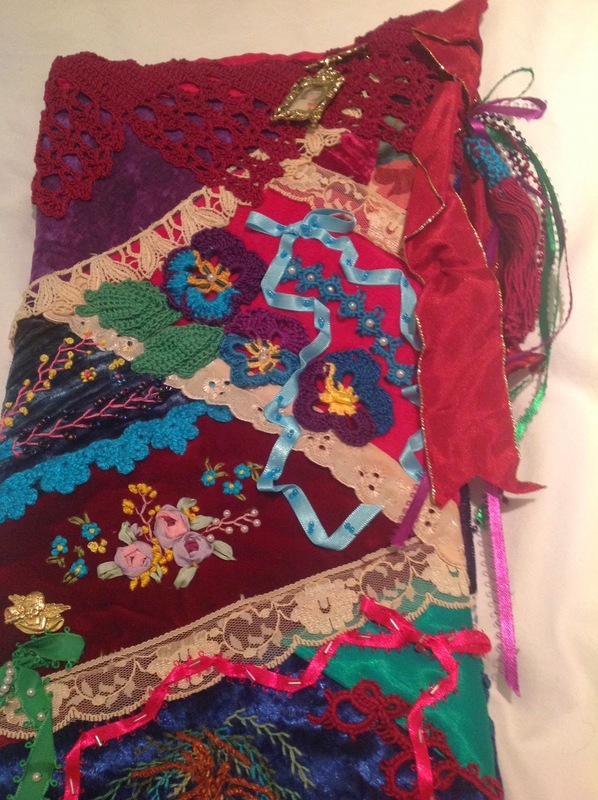 Here you can see the silk ribbon embroidering as well. 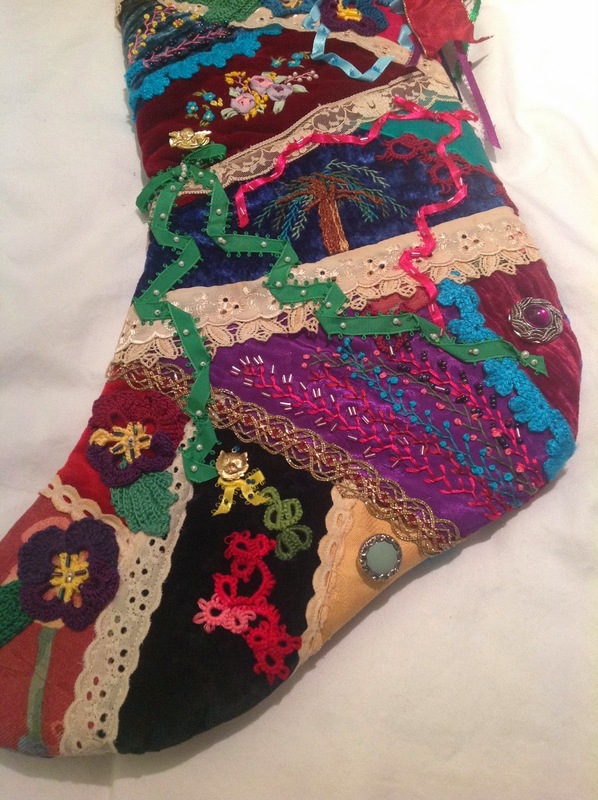 Wow, after looking at the stockings closely (in the pictures above), I realized that I had a lot of fun but it did take a lot of work! I did some trees again! This is the top ribbons (at the edge) with the loop to hang the stocking. 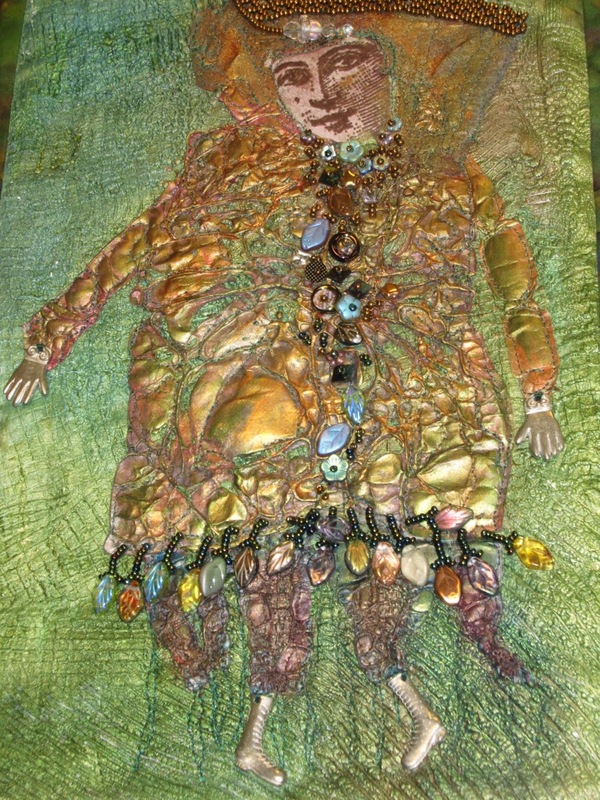 Well, I will put my crazy quilting aside for now and start on more ornaments for Christmas sales! This past Saturday I took a refresher beading course with a local talented header and teacher, Eileen Neill (Qualicum Beach, BC). It was a fantastic day, so much fun. We learned how to do some basic outline stitches (lazy stitch and couching stitch), three kinds of picot edging stitches, some fancy stitches (like spider web), all kinds of fringe, and the lacy netting stitch. The sampler we made is about 4.5" square. 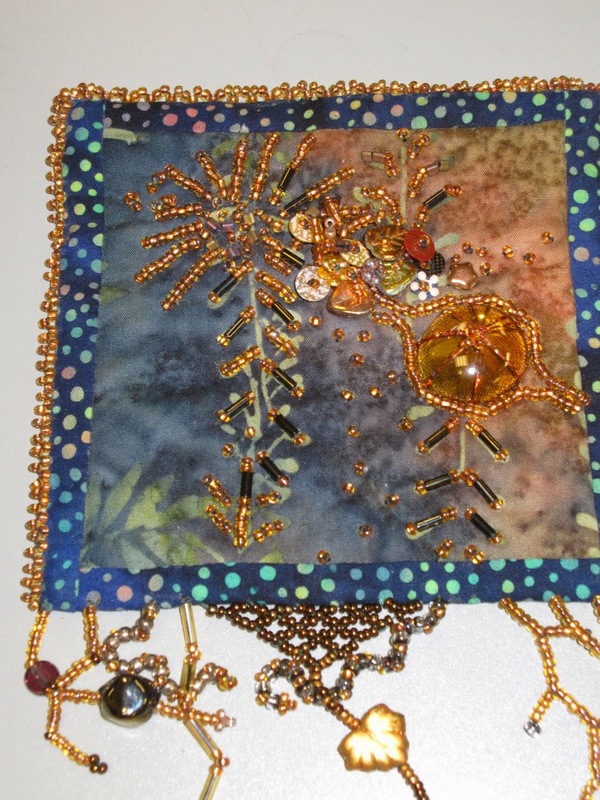 I took pictures of some samples that Eileen Neill made: (Our homework was to make the base fabric square, ready for beading). 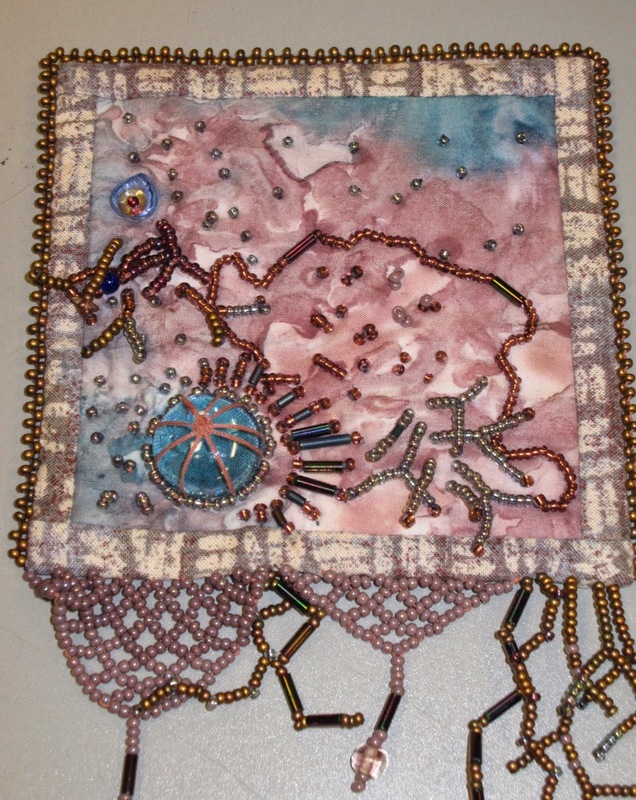 Eileen Neill also teaches peyote work. 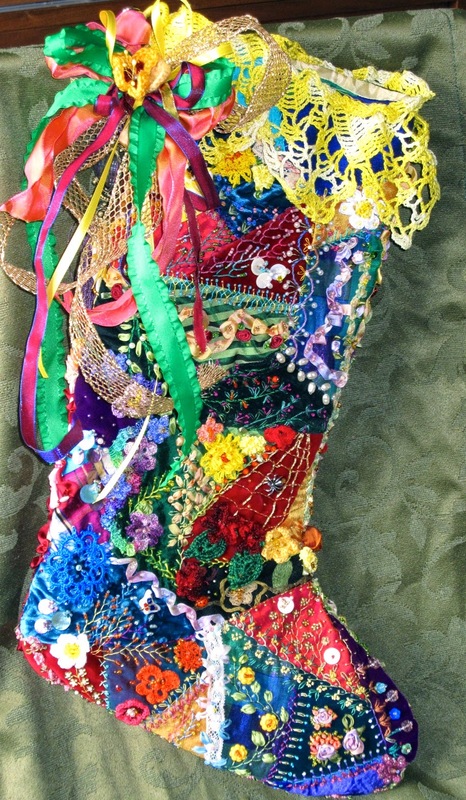 She has done a lot of pieces with Tyvek and burning techniques which produces interesting work. 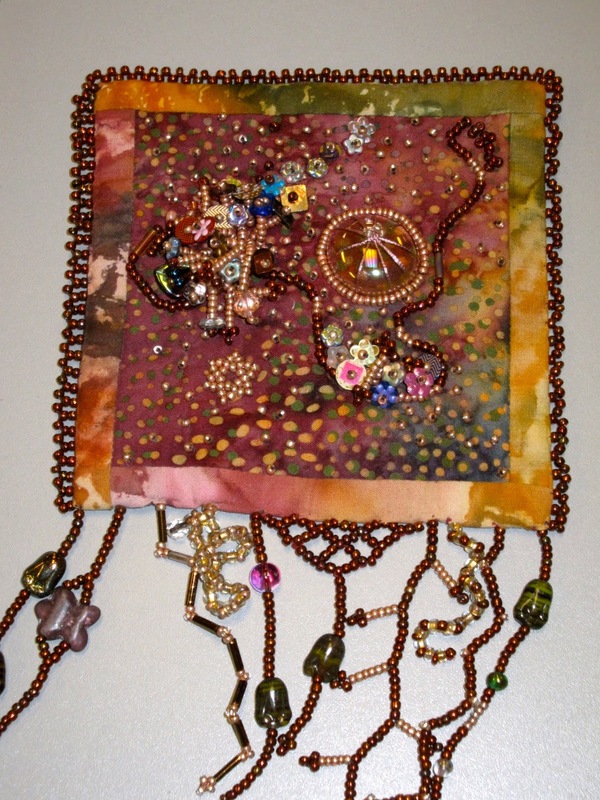 Beading is such fun and if I were not so busy making dolls, I would surely be a beader! This uses a face mold, tyvek, burning with heat gun. 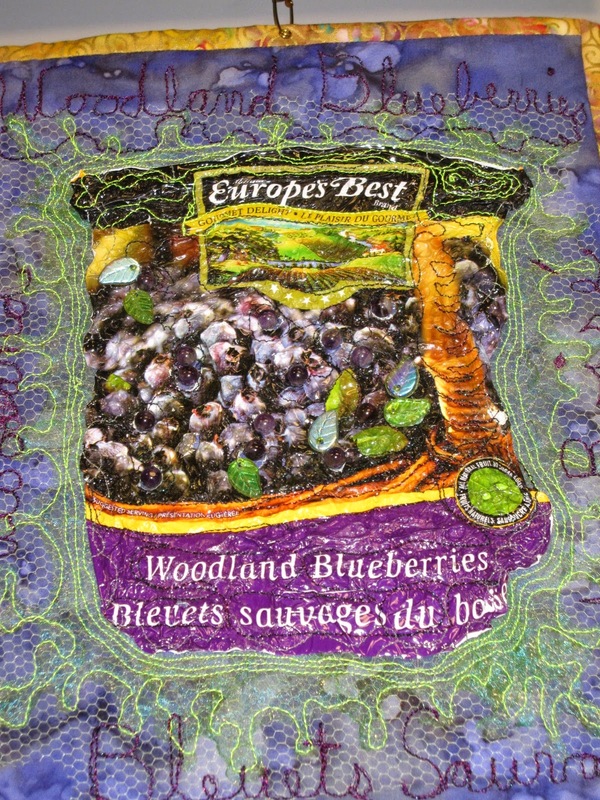 This is made by using a plastic bag (frozen berries) and using the heat gun before sewing with netting. Eileen does not teach the burning technique as it emits fumes indoors and must be done in open air. 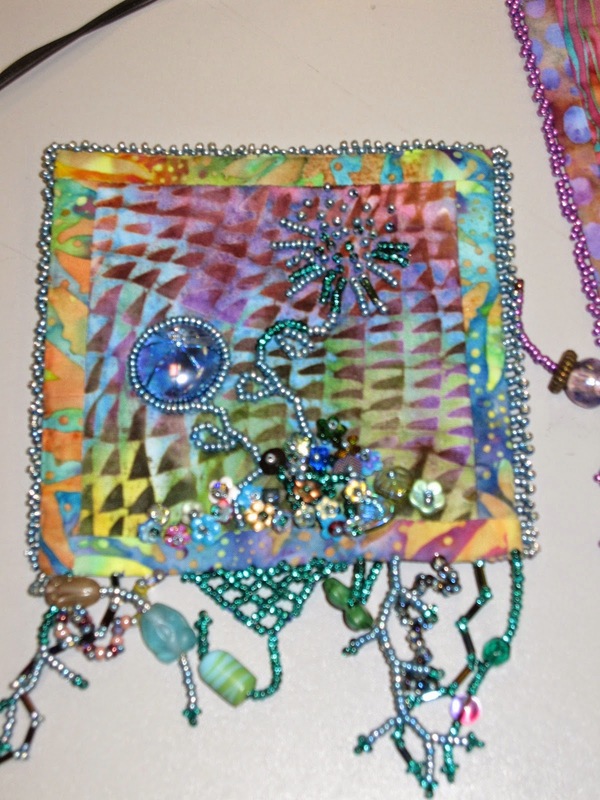 Here are three final beaded squares all made by Eileen: Notice that on all the squares the base fabric is batiks as they have interesting colour combinations and are a nice tight weave. 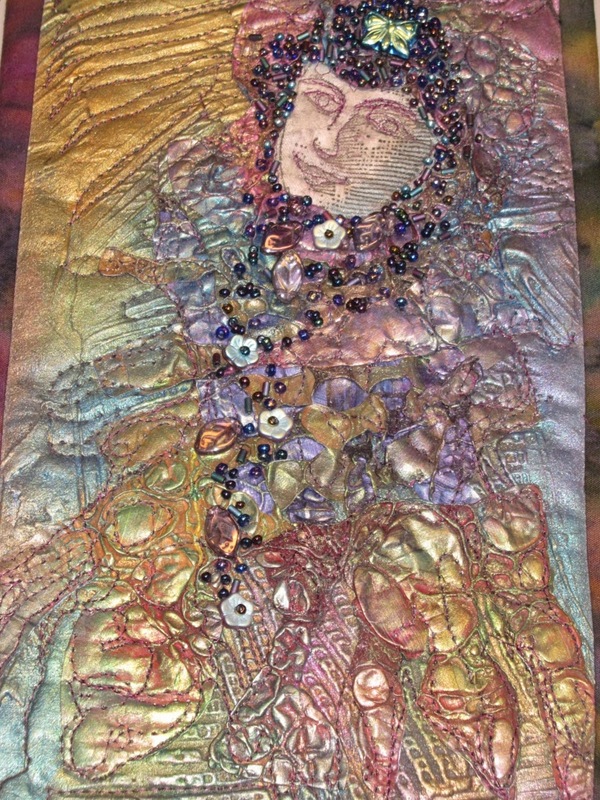 Eileen uses doubled "Coats Dual Duty" hand quilting thread, treated with beeswax (to strengthen) followed by Thread Magic (to lubricate) for the beading thread. This thread does not fray like Nymo does when beading cloth. 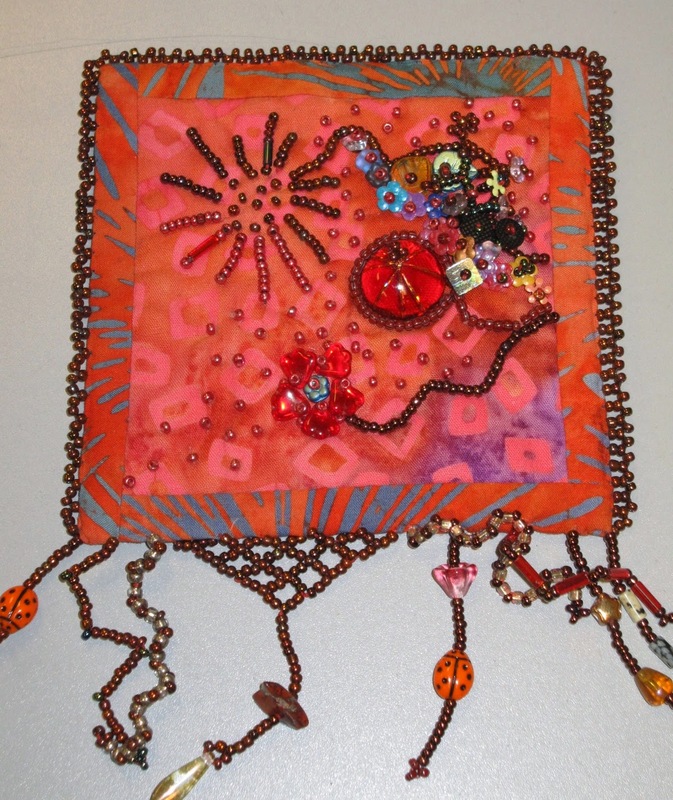 This class was originally developed for quilters that wanted to incorporate beading into their quilts but works equally well for doll makers. Well, it seems as if I am designing for the holidays. You have seen my Santa and now it is time for Halloween. A very special lady requested a witch for Halloween and as I will be very busy this summer, I decided that the best time to make the witch is now. I must admit that once I start on a project, I cannot stop until the end. 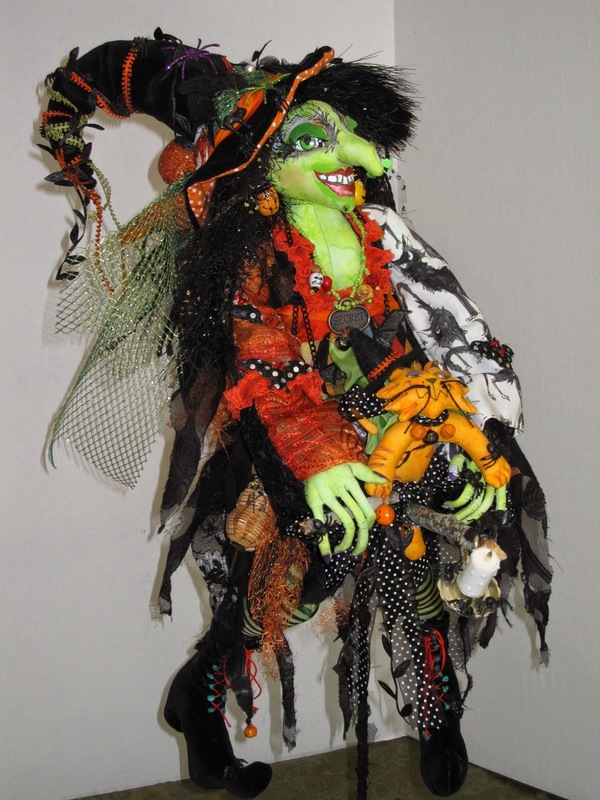 First I looked through my patterns for witches and choose one by Kate Erbach (Phat Phaeries Inc.) to use for my vision. 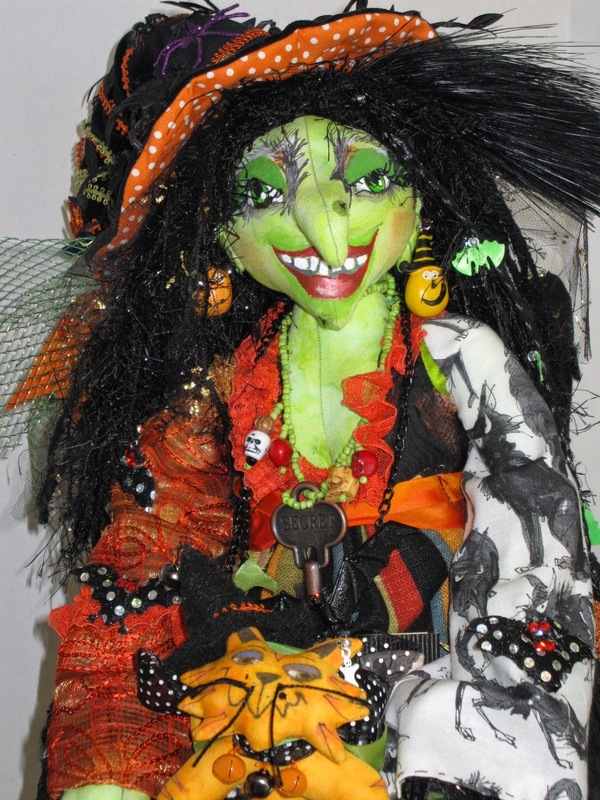 I wanted to make the witch green with very prominent eyebrows and lashes. I wanted black velvet boots and a cool cat and a funky broom and a wicked, wicked hat. I assembled all my fabrics (all those I thought I might use), trims, bobbles etc for the project and then went right to work. This project took two weeks from start to finish. Her stand was a challenge as I wanted her to perch on a stand with her broom but she was to also be able to hang (fly). When the doll was done, I went to the local hardware store and looked around. I found what I needed in a metal plant spike (the metal ones for the garden that have a round metal top for vines to grow through). I got the store to cut the spike to 16" (it was 24" to start with) and I took it home. I then drilled a hole on the base (already painted with added paper clay pumpkin, mouse, black net and spiders) and then inserted the spike. It worked but I had to add some metal wire for the back so that the top would have a seat for her to perch on. 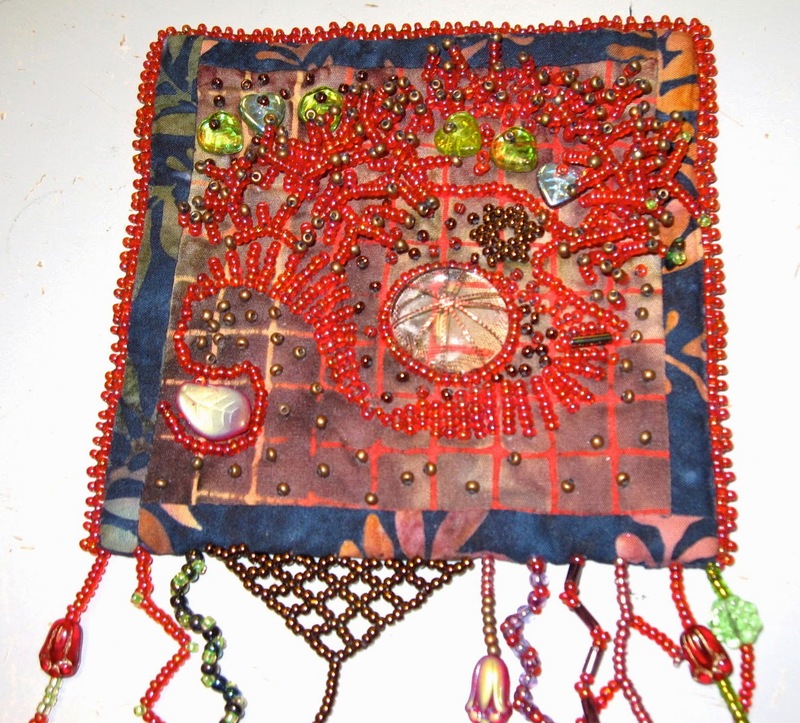 I then cut strips of fabric and covered the entire wire so that the piece would fit in. 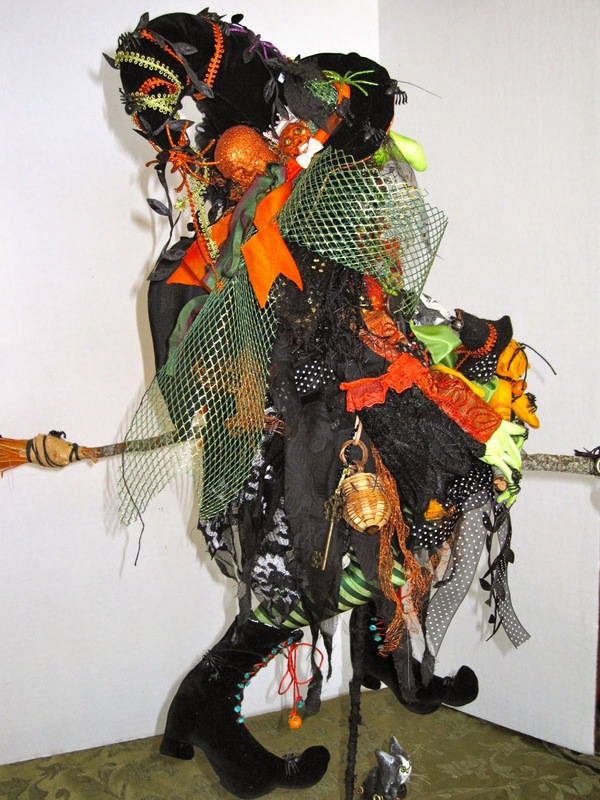 Finally I used fish line to place a hanger on the witch so that if the owner wanted she could hang her with her broom. 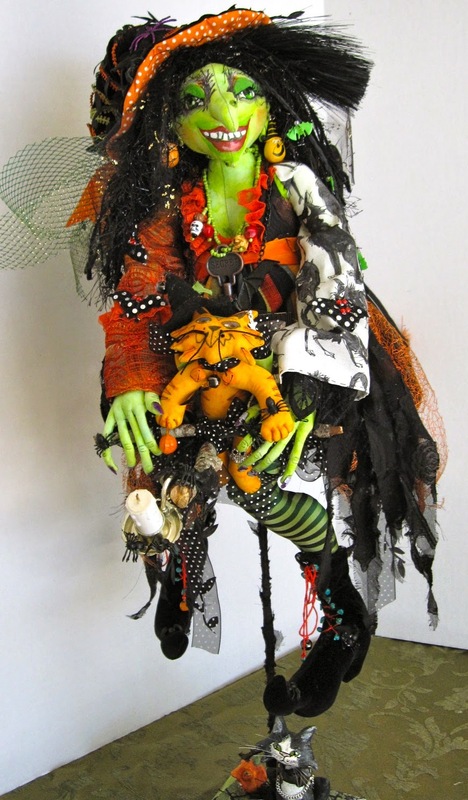 Here is Esmerelda and her kitty Spook: The kitty at the base is not staying with this piece. She is 30" high and 28" across with her broom. A close-up of her face: I used halloween fake lashes for her eyes an drew her eyebrows to look like a black tree. She has two warts made of green wool with black thread. Her hair is a mixture of fibbers including tiny braids that have bats in them. Back view showing a peak of her bat wing on her back that helps her fly. I hope you enjoyed her! In just over a month I will be heading east to Toronto to visit my family. I am very fortunate to be there for my mom's 84th birthday in September. My mom last visited me here in Victoria a few years ago and she loved the flowers at the beautiful Butchart Gardens as well as the city of Victoria's lamp post flower hanging baskets. 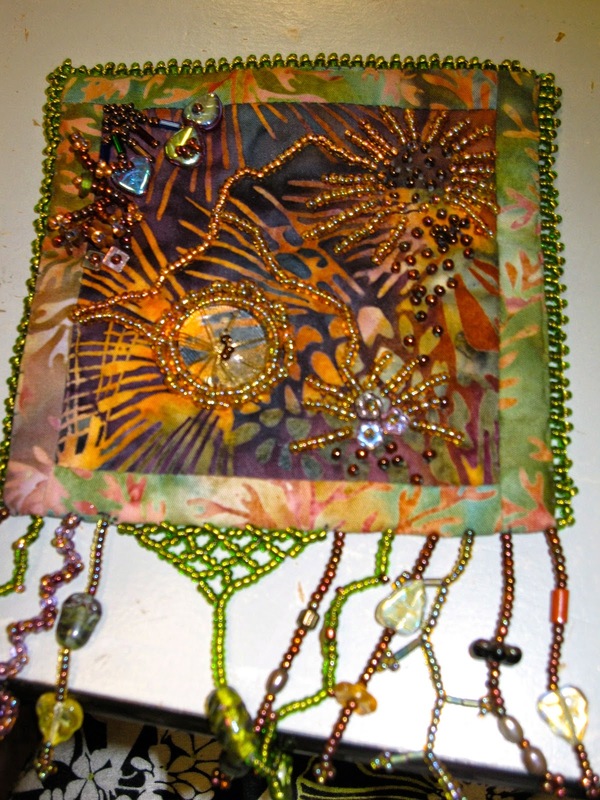 I wanted to make her a wall hanging to celebrate her birthday and her visit here in Victoria. 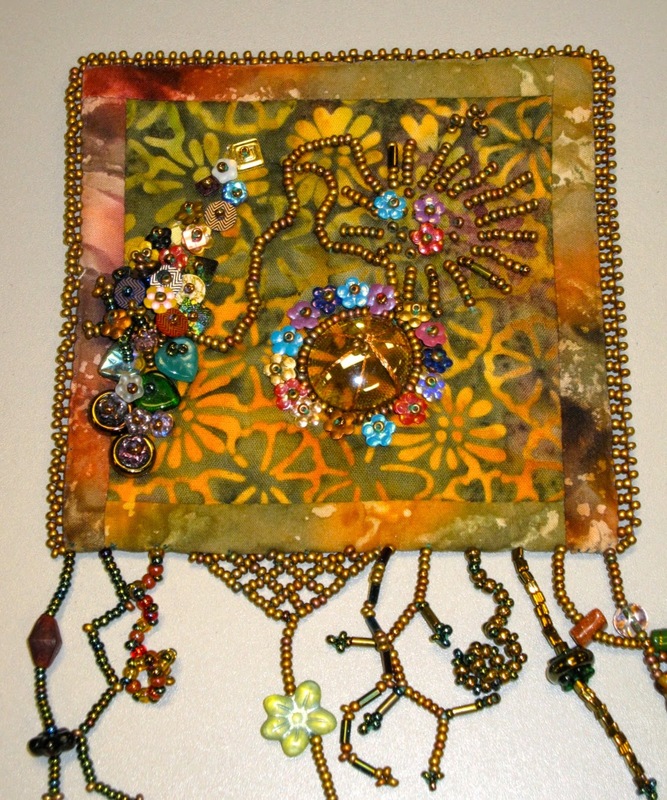 I decided to make her a wall hanging designed by local artist Susan Teece. 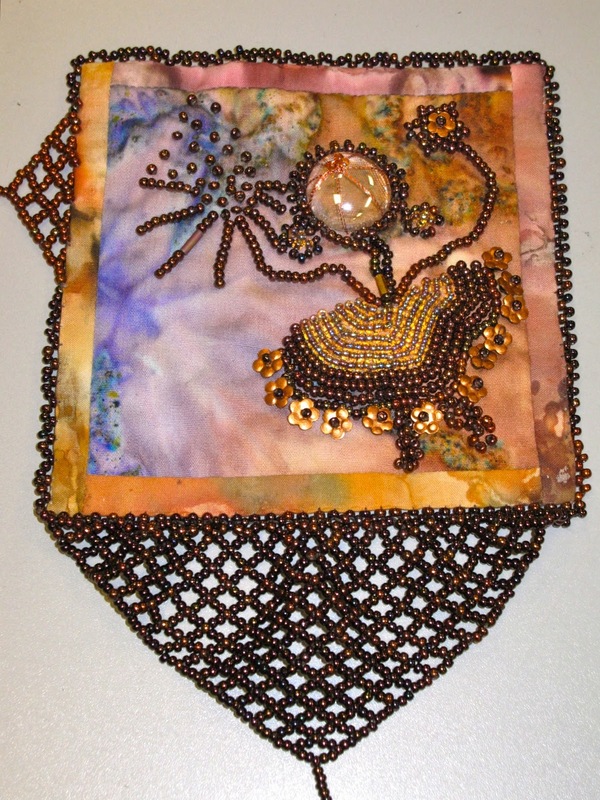 The wall hanging is 16"x26". 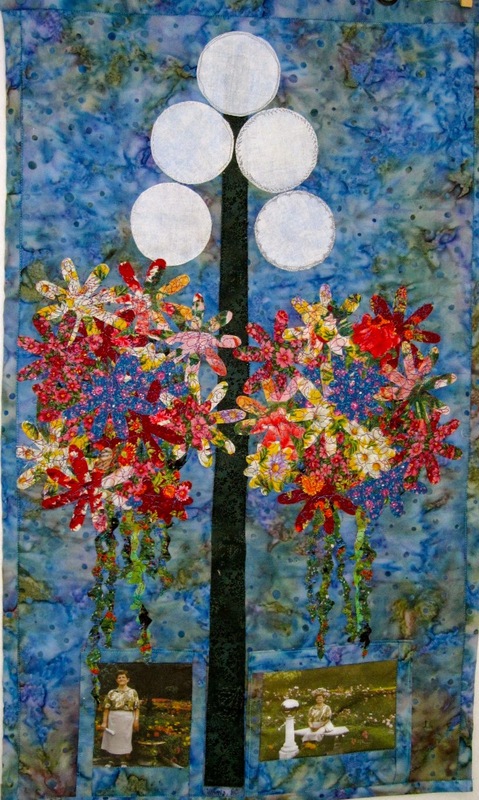 It was very easy to do as all the flowers were made using fusible web and then ironed on the background fabric. 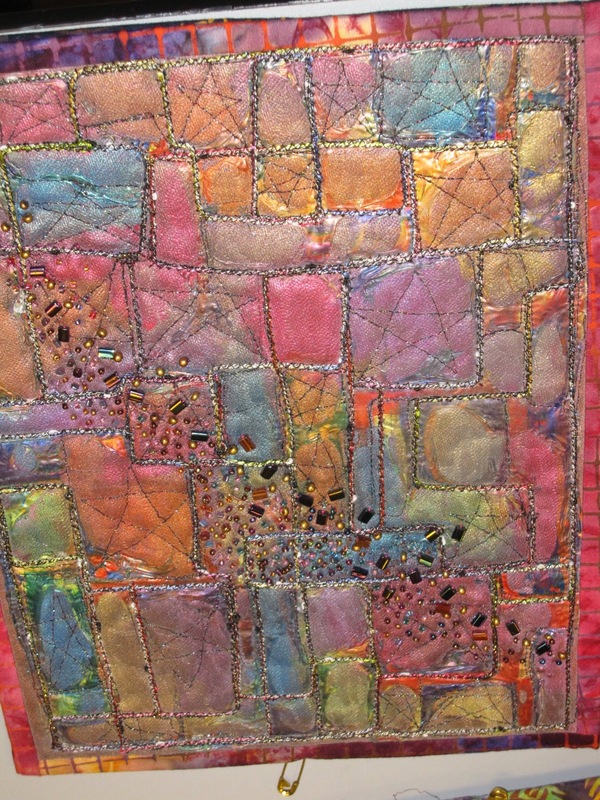 The quilting is done using free motion stitch with variegated thread. I used my printer to print a couple of photos of my mom that were taken at the Butchart Gardens here in Victoria. On the back of the quilt I added a photo of the two of us. The photos were printed on fabric using an inkjet printer (very easy). I am sure she will love her gift. I am stuck on cats at the moment. I love working with felt and doing hand embroidery once in a while so I took the online class (Phat Cat) by the master, Cristen Brown. 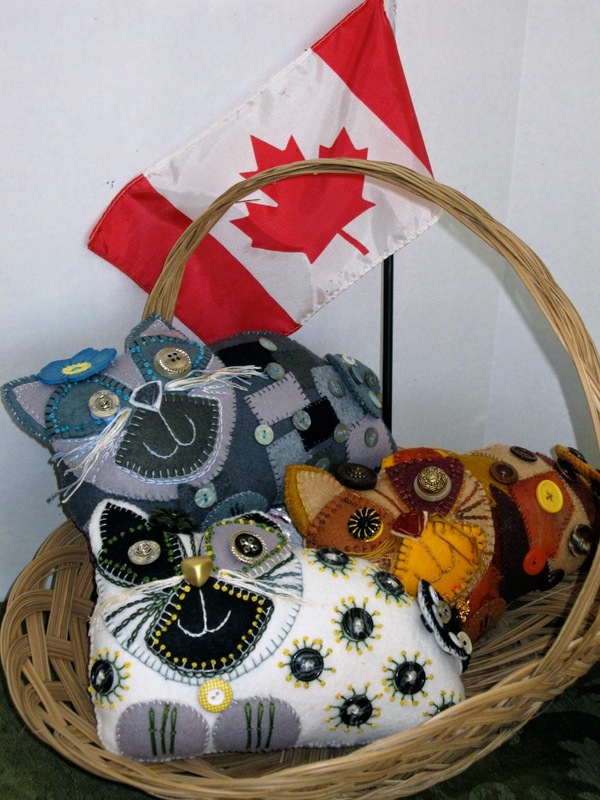 I could not make just one of these little pillows (about 8" across) so I have made many! We cannot forget Missy, the Siamese cross or she will be annoyed! Finally, here are the three amigos (Buttercup, Bluebell and Scruffy), together in their basket. These wee kitties were fun to do and I got to use a few of my many buttons!